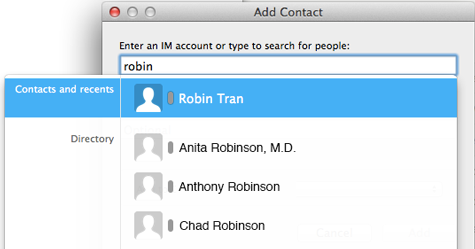 From the Jabber application menu, click Contacts > Add Contact. The Add Contact window opens. Type a name in the Enter an IM account field. Jabber searches for potential matches. Click the desired contact name from the search results. 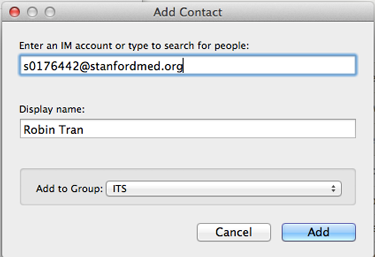 Enter a display name (optional), or add the contact name to a group (optional). Click Add. The name displays on your Contacts list. To start a chat, double-click a contact name or search by name and then click the desired search result. 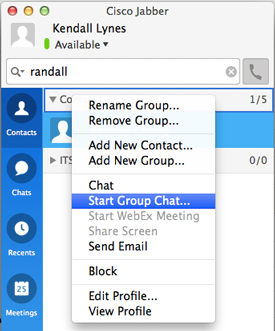 To invite everyone in a Contacts list group to a chat, control+click the group name in your contact list and click Start Group Chat. To add participants individually, begin your chat with the first participant, then click the add participant button in the lower right-hand corner . 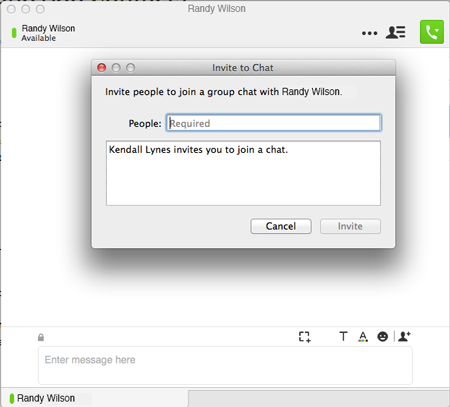 In the Invite to Chat window, search for the next participant by name and click Invite. Add the remaining participants in the same way. The group chat ends when all participants leave.